Presumed consent is illiberal and unnecessary and the ends do not justify the means - especially when there is a better way of ensuring we get more donor organs to save lives. As a general rule to governing, persuasion is always better than diktat. However, the Welsh Assembly government’s decision earlier this month to implement a policy of ‘presumed consent’ in relation to harvesting human organs for transplant, inverts this rule in spectacular fashion. First, it has to be conceded that the intention here is clearly a noble one: ensuring there is a plentiful supply of much-needed organs for transplant, with three people dying each day (1,095 a year) as a result of the shortage. However the question is: at what cost? Presumed consent clearly makes the very term ‘organ donor’ redundant. Under this regime, there is no donation. It’s replaced by a so-called ‘soft opt-out‘, which in practice means that unless a person clearly ‘states a wish’ otherwise it will be assumed that they agree to have their organs taken at the point of death. Welsh health minister Mark Drakeford claims the new Human Transplantation (Wales) Bill simply makes the most of the Welsh people’s “generosity”. The legislative change is expected to take effect from 2015 and there will now be a two-year information campaign to encourage people to sign up to a new register to record their choice, in the event of their death. So many important supplementary questions abound. Presumably, the need to harvest the organs means these decisions will need to be taken in a very short timescale. How hard will the NHS be expected to work in determining the view of the deceased? Will we see a scenario where, say, the organs of an asylum seeker or foreign student – whose family are overseas and may not learn of their loved one’s death for days – have their organs removed, only for the family to later complain that it was against the deceased’s religion or custom? What is the rate at which organs will be taken? Will they be taken routinely or just to address the immediate known need of a waiting transplant patient? The risk must be that this significant change in the relationship between the citizen and the state will harm patient trust, with more people actively making it clear they will not give carte blanche approval for their organs to be taken. After all, scandals involving clinicians abusing their power have taken their toll in recent years, especially the child organ scandals of the late 1990s, when thousands of dead babies and children had their organs harvested – without parental consent. The subsequent investigations found that more than 100,000 organs had been retained by hospitals and medical schools, while some of them were even selling organs to pharmaceutical companies. Indeed, it is legitimate to ask in this instance whether a surfeit of organs taken under this new policy will find their way into research labs rather than patients’ bodies, undermining the (admittedly compelling) emotional case for presumed consent. Underpinning this whole issue, though, is a clear failing by the NHS, over many years, to convince enough people to become volunteer organ donors. Rather than reaching for statute, Welsh politicians should be reaching for a marketing plan to improve this situation and convince more people to volunteer. Although it is true that there are not enough donors, it is encouraging that this situation is rapidly improving. Since 2008 there has been a 50 per cent increase in organ donations, leading to a 30 per cent increase in transplant operations. 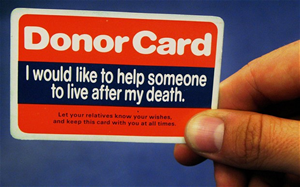 To convince as few as 1,100 more people a year – just 0.001 per cent of the UK’s 62.7 million population – to donate their organs seems eminently achievable without recourse to such a dramatic extension of state power. The rise in donations since 2008 is generally attributed to the persuasive skills of trained nurses explaining to grieving families how their loved one can leave a powerful legacy in assisting another person to live. This is surely the right approach, and, more importantly, it is evidence-based and clearly working. The change in policy will undoubtedly lead to painful cases where a dying person’s wishes are not obliged, potential litigation ensues from families claiming they were not informed in good time of their loved one’s death in order to lodge an objection and, crucially, wider public trust in the NHS may be forfeited. Presumed consent is illiberal and unnecessary and the ends do not justify the means – especially when there is a better way of ensuring we get more donor organs to save lives. Donor rates in the uk are tragically low and lead to massive waiting lists. One a person is dead what possible use could they have for their organs. Donor cards as a system have been failing for years. The move by the Welsh assembly is long overdue, and I support it wholeheartedly. Lets start harvesting the organs of MPs. It’s immoral. It is not the states. It’s not anyone else’s to take. Its only the owner’s decision that should be allowed to donate anything. I worked out that only 0.6% of those who die waiting for an organ were actually from Wales. So why we need this legislation is completely beyond me. The majority of any organs farmed in Wales will go across the border, which is also where the donor committee are based. I’m not against this but I would like to see people here prioritised and that is not something that is currently allowed. And given our poor transport links not something that is likely to happen. If you want to read more from a Welsh perspective then see here. I thought this was a bizarre move. I haven’t exactly been overwhelmed by advertising encouraging me to become a donor. I’d think they actually try promoting donation before just assuming they can take people’s organs. Trust Labour to assume state control is the best solution to any problem.